Randomly, those wacky tastemakers at Lost Hemisphere got me interested in Circle Orboros with an offhand mention of the excellent Wold Guardian model. The past couple of weeks have seen a wealth of information about upcoming releases for Circle, including probably the coolest-looking Warlock to date, Cassius the Oath-Keeper and his favorite pal…Wurmwood, Tree of Fate (I said coolest-looking, not coolest-named). News also came of Nuala the Huntress, the Unit Attachment for the very-scantily-clad-and-yet-totally-hands-off Tharn Bloodtrackers; the Officer and Standard Unit Attachment for the Reeves of Orboros (who bring preposition inconsistency to Circle Orboros); and finally, we have seen the cover artwork for the upcoming book, last to be released of the primary Hordes factions. It seems all three of these are coming in November. In addition, the Druid Wilder Warlock Attachment was sneak-preview-released at GenCon, and will be released widely in September. I don't think they are here to invite you to the drum circle down at the community center. 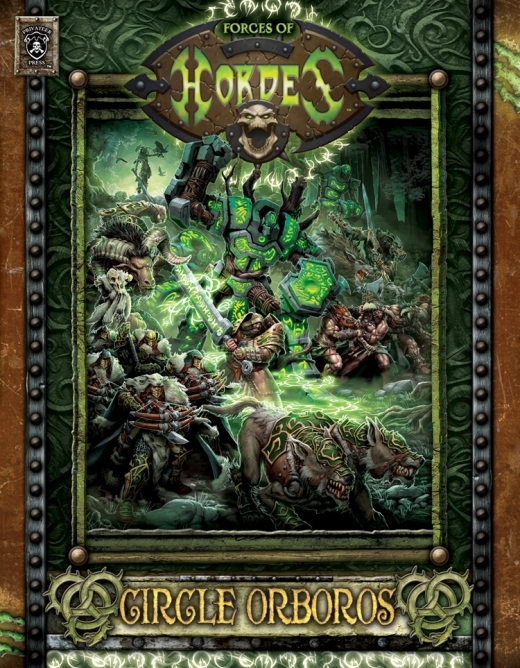 Now here’s the thing: I had decided to start putting together the list I had designed for Zevanna Agha, the Old Witch of Khador, but all of a sudden, I seem to start thinking of Circle Orboros as “my” faction. I have had to go back through this post and change the wording from “we get” to “Circle gets.” There are some more reasons I am leery of the change in direction, however. I like the fact that Fury allows you to be more flexible as a turn progresses, with Focus being more about gambling on your chances for the turn ahead. Fury does, on the other hand, mean that you need your Beasts more. A Warcaster can still win handily when their Warjacks have been eliminated, and in fact can even be stronger because they don’t have as much on which they can spend Focus; this allows a Warcaster to be more aggressive with their Warjacks, I feel, since they can more afford to sacrifice them. I also don’t like that Fury can make you lose control of your Beasts, but again, it allows flexibility to take that chance if you really want to push your luck and use more Forced attacks in a turn. Hordes casters do seem to be balanced slightly below their Warmachine counterparts. Their spells have more tradeoffs and their feats are generally slightly weaker, not to mention they seem to have a lot of weak points against Warmachine forces in a way that the Warmachine forces do not suffer. The beasts seem to be stronger than the Warjacks, however, and they are more flexible; the Animi really make up for the lower power of the Warlocks, again at the cost of Fury management challenges. Hordes infantry seems also to be devalued, at least at the 35 point level. This may not necessarily be a bad thing, but I feel like it limits some options in scenario play, and I really like modeling infantry. I don’t want to get involved with something of the size of Warhammer/40K armies, but I do like the variability of the forces, the opportunity to paint more, and the visual impact of a group of similar models on the table. So now I introduce further indecision into the mix. That said, at least I have decided on the Witch, after all, should I start with Warmachine. The possibility exists, of course, that I could start with a small force each of Khador and Circle, but then my initial investment is really diluted and it takes me much longer to get to a position where I can start playing with larger forces.